Trust the rich to make Whatever’s Been Going on at Mumblesby? an intricate braintwister of a cozy mystery. It’s 1981 and Flaxborough’s upper class neighboring town, Mumblesby, is in an uproar. First, solicitor Richard installed Zoe Claypole, a girl from the wrong side of the tracks, in his house as his common law wife. Second, Richard died leaving his estate to Zoe. Finally, someone hatched an elaborate plan to burn down Richard’s house with Zoe in it. What about the expensive antiques with questionable provenance throughout Richard’s house? 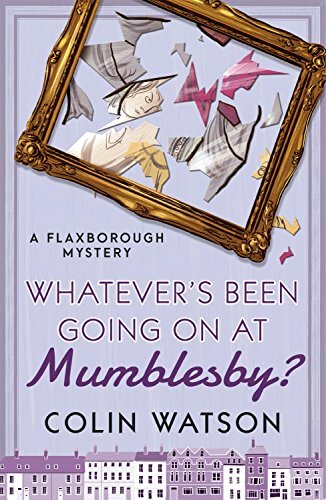 If you thought Flaxborough had some bizarre crimes, wait until you see Whatever’s Been Going on at Mumblesby? It’s sad to think this is the last book in the Flaxborough series. I’ll miss this zany take-off on the Miss Marple type British village cozy mystery. However, Whatever’s Been Going on at Mumblesby? is an excellent end to the series. It is an intriguing puzzle sure to enchant all armchair detectives, myself included. 4 stars!